Photo of the Week: Spring has Sprung! 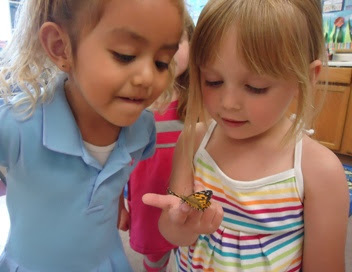 Learning about butterflies. Thank you to all our mommies who came to the Muffins with Mommy event. The children sang songs to their moms and then enjoyed tasty muffins, fruit, and juice. It was a great success! We would like to wish all our Fairmont mothers a very Happy Mother’s Day this coming Sunday. You Are Invited To Our "Lunch & Learn"
Ms. Rafat in conjunction with Mrs. Duvall at the Mable Campus are hosting a Lunch & Learn event for potential new families. If you have friends, family or colleagues who might be interested in this event, please consider sharing this invitation. You are also welcome to attend along with them. The purpose of this time is to introduce potential new parents to Fairmont as well as to learn how Fairmont makes the difference at every grade level. During our time together, we will meet with some faculty members and administrators, and have a Q & A time together. We want to extend an invitation to parents of all our Citron students to join us for an hour of coffee and conversation. This might be a good time to ask questions about your child's next grade level, to share insights about this past school year, or just "pick our brain." There is no set agenda - just whatever interests you about Citron. Please join us for coffee, pastries, and great conversation. Our Spring Musical is just around the corner! Each child will be wearing a specific costume that correlates to their classroom performance during the production. If you are unaware of your child’s costume requirement, please check Mrs. Beilman’s Blackboard page. All songs and lyrics can be found on the Blackboard page under the tab “Songs for the Family”. We strongly encourage you to visit the page to engage your child in extra practice time and become more confident in their song. If your Blackboard log-in has been misplaced contact Ms. Dodson at the Citron office. Please try to set aside May 18th for the Jr. K and Elementary performance, and May 19th for the Preschool performance so you can come and enjoy the musical talents that have been serenading the Citron Campus.